1. How to remove excess wax from candleholders? It is best to remove the hot wax drippings as soon as possible, but if this cannot be done, the candleholder should then be placed in hot water for a few minutes, so that the wax will become warm and be easily removed. Since silver is a metal, it transmits heat, so please be very careful when handling. Remember also to wipe all the excess water immediately with a soft dry cloth so no drop stains will remain. The thickness of the silver – In low-quality silverware, it is possible to find tiny “crevices” and cracks in the silver behind the embossing. These crevices could be caused by the low grade, thinness and low weight of the silver, which is affected when it is bent. High-grade silverware, made of thicker silver, will not have any crevices or cracks. Checking for this is easy and simple, just pick up the item and look at its back or bottom through the light. 2. Why does silverware turn black? Silver is a precious metal that has the tendency to become yellow and then turn black. This is called oxidation and is a natural process that occurs due to contact of the silver with the air. To preserve silver shiny clean for a long time, we recommend that the objects be softly wiped every two weeks. This will prevent the silver from becoming yellow or black. Also, we recommend maintaining silverware behind closed glass doors to prevent contact with the air. The stamp of quality – On every piece of high quality silverware, there must appear a stamp with the number 925 and the manufacturer’s name. The number 925 testifies that the article is made of the highest international standard of quality for sterling silver and that it contains 92.5% of pure silver and 7.5% copper. A reliable manufacturer defines the high quality of his merchandise, since he is solely responsible for the quality of the silver (just as we don’t buy gold in the supermarket, but we go to a reliable shop). The stamp is usually found at the back or the bottom of each item. Look for it. 3. How to clean silverware? For deep cleansing and perfect shine we recommend using the silver cleaning creams or spray by Hagerty. Hagerty products are easy to use and have almost no side effects caused by strong scents and excess cream. Hagerty products contain R-22, which creates a protective layer on the silver and therefore delays the oxidation process. Hagerty products don’t harm the silver coating and are Kosher for Pesach and for every day of the year. Joining and soldering – If the signs of joining and soldering can be seen on the silverware, this is proof of the low grade of its finishing process. High-quality silverware is produced in one piece and should have no signs of artificial joining. 4. How to shine silver objects? To preserve the shine of your silverware, the objects must always be well cleaned and wiped. For this purpose, we recommend using a cleaning preparation and gloves. No sharp utensils or rough cloth should be used when cleaning silver as they could cause scratches on the silver surface. Clean the items softly and do not use force, particularly when cleaning candelabra or candleholders, which have fine parts and could bend out of shape. Silverware that comes in contact with food must be washed after each use, especially if it has come in contact with vinegar, wine, lemon or salt. After washing, the object must be wiped dry with a soft cloth. How to recognize good-quality silver? Complete design – It is not necessary to be a silverware designer to understand when an object is made of “leftovers” from other objects. The foot could be decorated with flowers, the bottom with grapes and the top with Oriental-style filigree! This is a mixture of low quality leftovers that were made into one single object. A silver object is perfect only when all its parts are made in one complete and uniform design. 5. What gift to buy? We are now in between the holidays and now the question of what gifts to buy for weddings is here again. A silver object is always a prestigious, practical, beautiful and original gift. It is preserved for many years, it is passed on from one generation to another, and it is dear to the giver as well as the receiver. A silver object can be given for any occasion and according to the available budget. As a wedding present, when a young couple establishes a new home, is a wonderful opportunity to make a gift of silver. There is a great variety of prices and objects that are suitable for the groom and the bride, like an elegant decorated Kiddush cup with matching dish, candleholders, Havdalah set, a tray for slicing challah, a mezuzah, salt and pepper shakers, vases, trays, etc. The Smallest Details: the sharpness and depth of the small details in the design also determine the quality of a silver object. The attention given to each dot and each line in the design, together with a perfect finish, is what gives each article its uniqueness and high quality. In order to reach perfection in small details, great care must be given during all stages of design and production. The results are clearly seen, compare a high grade silver item and one where the small details have not received special attention. Your will see the difference. Although it seems ironic and not many people know it, wine can actually damage the silver coating in a cup, leaving stains that cannot even be removed with the best of silver cleaning preparations. So, immediately after the blessings and the Kiddush are finished, the goblet must be wiped clean with a soft dry cloth. This should be done with all silverware that has come in touch with wine or with other liquids. Most of us are familiar with the small black or rust colored spots that can appear on silver objects. These are caused by the salt contained in water and in wine, therefore silver items should not be submerged in water for a long time. Always keep them dry and shiny. The finish – how is the finish done on silverware? Pass your fingers through the outside and edges of the object. Is it sharp and cutting or round and smooth? The finish is a most important part of a silver object, especially in a goblet that is in touch with our mouth. Also, a smooth hard finish strengthens the object and prevents it from losing its shape. A “soft” object will easily bend and shows low quality. Silver has been considered a prestigious and desirable gift since the middle Ages. For thousands of year, silver was the material used for jewelry and other artifacts, and also for commerce and the casting of coins. In the Bible, we find many mentions of silver: Eliezer, Abraham’s slave, gave Rebecca silverware as a gift and Joseph’s silver goblet was hidden in Benjamin’s garments, the women of Israel were asked to borrow silverware from their neighbors, during the exodus, to be used later for many of the temple’s artifacts. All the people of Israel have, throughout the years, considered silver a kind of “sacred commandment” and so silverware become not only an object of adornment but also a symbol of sanctity. 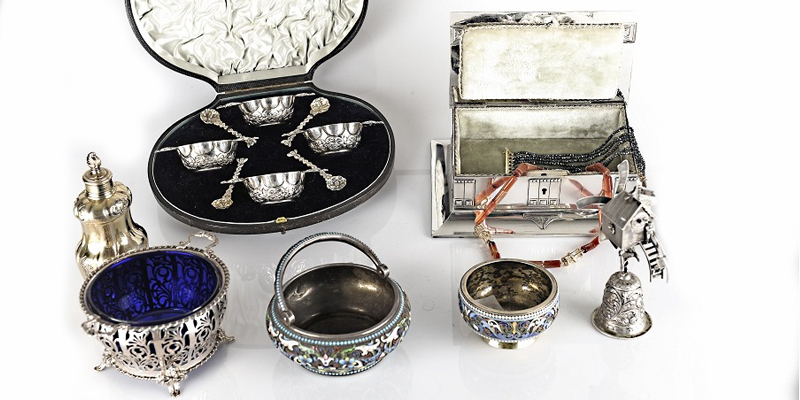 The Collection – Make sure to find out if the silver object you are interested in is part of an entire collection of items based on that design or whether it is an individual item. Only a large, well-known firm is able to offer an entire group of items made in the same design. Then you will be able to gradually complete a full silver set, with the different objects in the same design concept. Products that combine silver with other materials are today a modern tendency. These items require a particularly delicate treatment. Silver combined with wood: the silver and wood may be cleaned only with soft and dry cloth. It is recommended not to engrave products integrating wood and silver. Do not use any cleaning agents. Silver combined with leather: the silver and leather may be cleaned only with soft and dry cloth. It is recommended not to engrave products integrating leather and silver. Do not use any cleaning agents. Silver combined with glass or crystal: the silver parts must always be cleaned as above, the glass must be washed and dried with a clean cloth. We recommend not to engrave objects made with two materials. How to recognize good quality silver? A year later – Another test you can perform to know the quality of a silver object is to be done a year after it is purchased. When you buy them, all silver objects are beautiful and shiny, but what has happened after a few months of use? Is it still shiny or has it turned dull? Is it scratched or bent out of shape? A good quality silver object will maintain its beauty for many years, due to the thickness of the silver, the strength of its finish and the attention given to its smallest details.